The model, revealed soon after the premiere appearance of the twin-turbo gas V6-powered LS 500 at the 2017 North American International Auto Show (NAIAS) in Detroit, is a further manifestation of how Lexus has reimagined the luxury sedan, presenting brave design, exhilarating performance and a sophisticated appeal to capture the imagination of forward-thinking, younger customers. 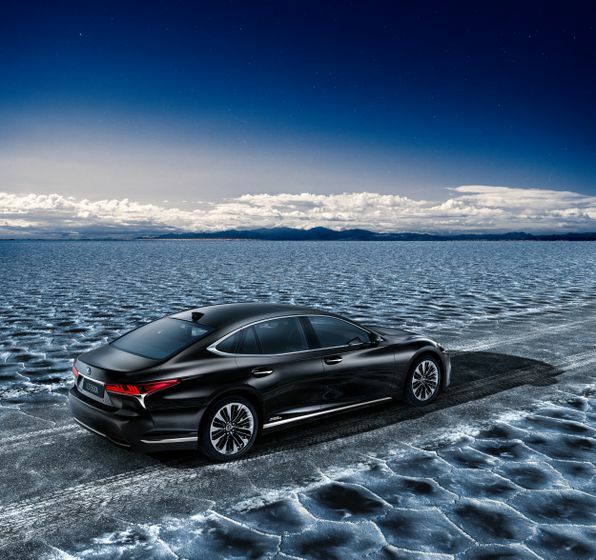 The car’s design successfully brings together the virtues of a long-wheelbase four-door sedan with a low, coupe-like profile, positioning the LS perfectly across the two growing sedan and coupe segments. The cabin has benefited from an equally new approach, focusing on “progressive comfort,” interpreting Japanese aesthetics and craftsmanship traditions in the context of an advanced, luxurious and innovative vehicle interior such as the original door trim ornamentation. 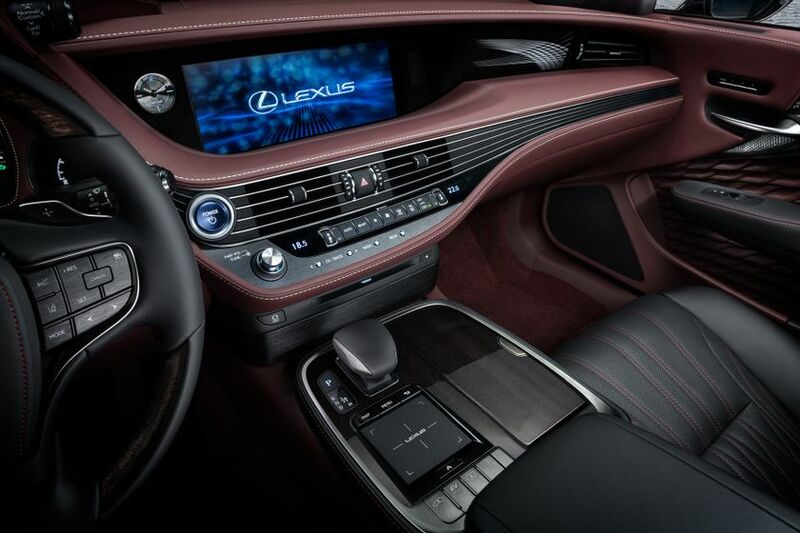 Notably the LS 500 was honoured at NAIAS with the EyesOn Design Award for excellence in interior design. 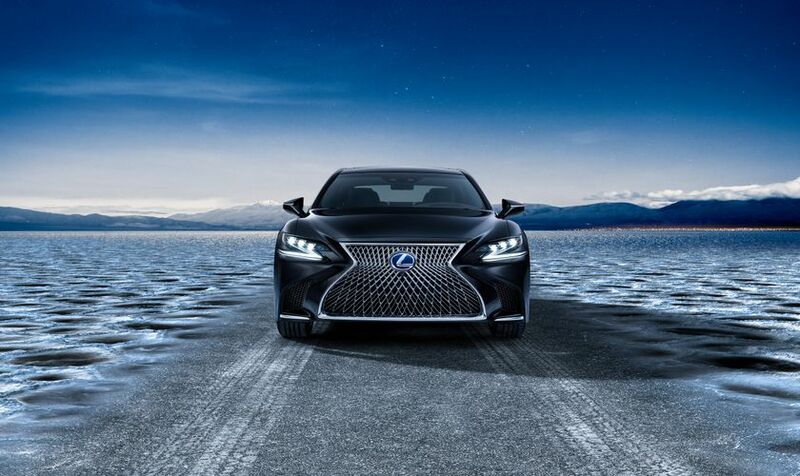 The LS 500h is equipped with the new Lexus Multi Stage Hybrid System, a technology that transforms the performance and driver appeal of hybrid, providing improved responsiveness and more rewarding, linear acceleration, particularly when moving off from stationary. At the same time, the inherent fuel and emissions efficiency of Lexus Hybrid Drive has been further improved. The powertrain features a 3.5-litre V6 Dual VVT-i V6 gas engine and two electric motors, together delivering maximum system power of 354hp. 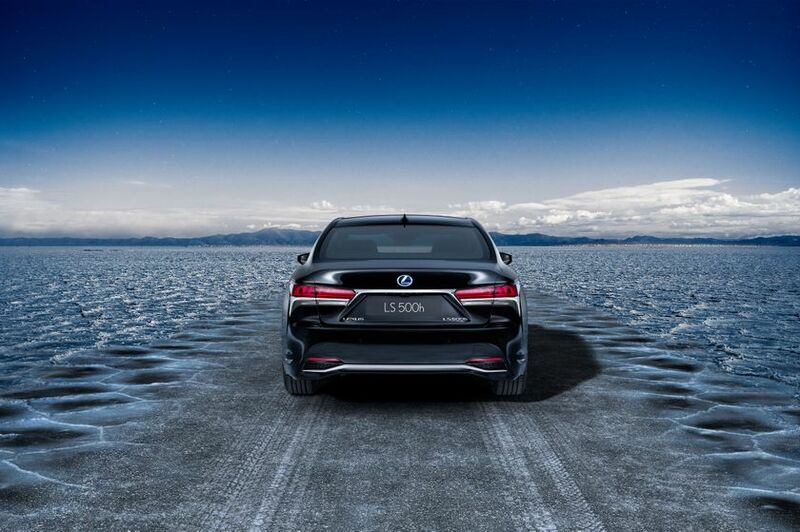 The LS 500h is built on the new Lexus Global Architecture – Luxury (GA-L) platform, which ensures a low centre of gravity and optimum weight distribution, contributing to the car’s essential stability and handling agility, which in turn deliver increased driver rewards. The fundamental high rigidity of the chassis allows the new multilink suspension to be tuned to achieve a great handling performance and the supreme comfort for which the LS is renowned. The car’s dynamic performance benefits also from the co-ordination of braking, steering and stability systems through Lexus Dynamic Handling. Advanced technologies are further used to deliver impressive safety performance. The LS 500h’s Lexus Safety System+ package additionally includes a new advanced safety system, which features the world’s first intuitive pedestrian detection function with active steering among other innovative technologies. Omotenashi, expressing the unique sense of Japanese hospitality, defines the LS 500h’s whisper-quiet and luxurious interior. Supreme comfort is provided by front and rear seats with multiple power adjustment, heating, cooling and massage functions. There is also an optional rear seat arrangement that includes an extending leg ottoman and the most generous leg room of any LS generation. Notably the new LS 500h is longer even than the current long wheelbase LS. The wheelbase increased from 3,090 mm to 3,125 mm. The LS 500h’s Lexus Multi Stage Hybrid System combines a 3.5-litre V6 Dual VVT-i gas engine with two electric motors, together delivering a total output of 354hp. The engine makes optimal use of Dual VVT-i (intelligent variable valve-timing), with timing precisely gauged in line with driving conditions, helping secure high torque at all engine speeds. The new LS 500h is equipped with Lexus’ Multi Stage Hybrid System, a breakthrough technology that transforms hybrid powertrain performance. The system adds a four-stage shifting device to the Lexus Hybrid Drive combination of a 3.5-litre V6 gas engine and two electric motors. 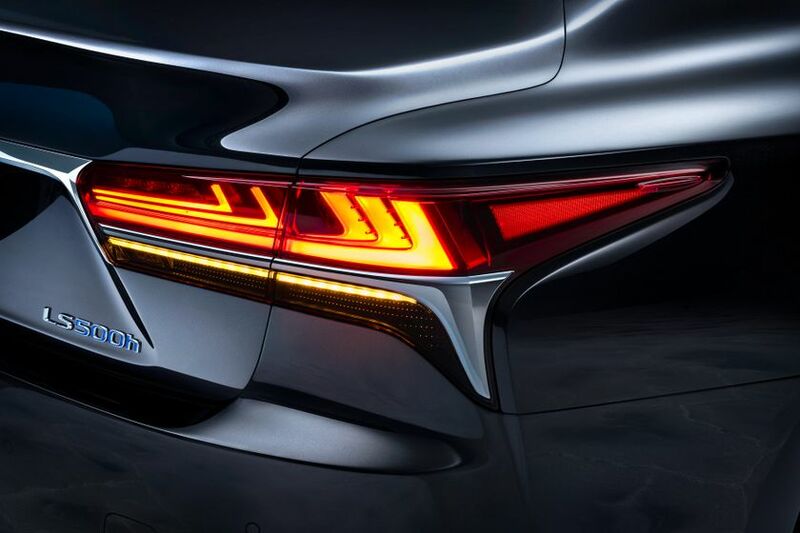 The result is more direct response to driver inputs and an elevation of dynamic performance driving pleasure, while maintaining the characteristic smoothness and efficiency for which Lexus hybrids are renowned. In a conventional full hybrid vehicle, engine output is boosted by the electric motor via a reduction gear, but with the new Multi Stage Hybrid System the power from the V6 engine and the hybrid battery can be amplified by the four-stage shifting device, allowing much greater drive power to be generated when accelerating from stationary and achieving a 0-100km/h acceleration in 5.4 seconds. High-speed cruising can be enjoyed at lower engine rpm and the LS 500h is able to run at higher speeds – up to 140km/h – with the gas engine shut off. The transmission further benefits from an improved version of the AI shift control found in conventional automatics. This enables intelligent, optimum gear selection to be made in line with driving conditions and driver inputs, for example when going up or downhill. The system also includes DMI (Driver’s Mind Index). This means it can adjust gear shifts to suit the driver’s style and behaviour, without the driver having to select a different drive mode to get the kind of performance they want from the transmission. 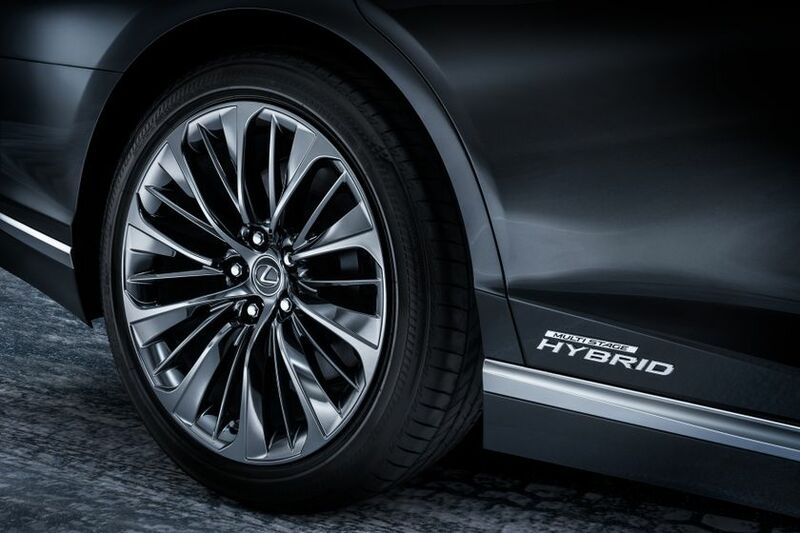 Thanks to the Multi Stage Hybrid System’s design, the driver is able to take advantage of an M mode to select and hold gears manually, using paddle shifts mounted behind the steering wheel – a function not previously available on a Lexus hybrid. Thanks to the co-ordinated control of the Power Split Device and the gear shifting mechanism, the gear shift will start instantaneously with the computer receiving the signal from the paddle shift, giving an exceptionally quick response. The LS 500h is fitted with a compact, lightweight, lithium-ion hybrid battery. It is 20 per cent smaller than the nickel-metal hydride unit featured in the current Lexus LS 600h, yet has a higher power density. It increases the luggage capacity by 25l (versus LS 600h). Using lithium-ion technology has also reduced the component’s weight, helping reduce the car’s overall mass, thus supporting overall fuel economy, emissions performance and handling balance. The LS 500 is powered by a new twin-turbo 3.5-litre V6 gas engine, matched to a 10-speed automatic transmission – a first for a luxury sedan. Highly efficient turbocharger and fast combustion technology combined produce high power to rival a V8 engine – 415hp and a maximum 442 lb-ft of torque – together with notable fuel efficiency. The LS 500’s 10-speed automatic transmission, first seen in the Lexus LC 500 luxury coupe, is a torque converter automatic, yet with shift times that rival those of dual-clutch transmissions. The wide bandwidth afforded by its closely spaced ratios is ideal for all forms of driving, helping provide an optimal gear for all conditions. The driver can execute shifts using paddle controls, but many will prefer to use the advanced electronic control system, which anticipates the driver’s input and chooses the ideal ratio by monitoring acceleration, braking and lateral G-forces. When accelerating from standstill, the close ratios of the low gears and the shortened shift time generate a rhythmical and exhilarating feel as the car gains speed. The twin-turbo engine’s high torque matches ideally with the higher gear ratios for effortless, relaxed motorway cruising, while very quick downshifts provide direct acceleration with no lag in G response. 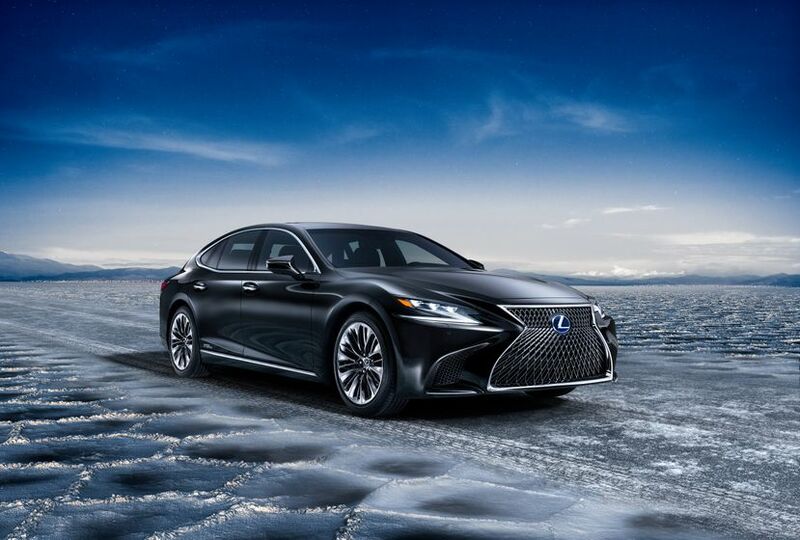 The LS is equipped with the Lexus Safety System+, additionally featuring a new advanced safety system. It extends the range of active systems available to the driver to help prevent accidents happening, covering the risks presented by four of the most common types of accident: rear-end collisions, collisions with pedestrians; accidents caused by lane departure and accidents at intersections. It operates by combining information from omnidirectional sensors around the vehicle, including stereo cameras, monitoring all operating situations from parking manoeuvres to collision avoidance. It includes the world’s first intuitive pedestrian detection function with active steering. If a pedestrian is detected on the road ahead and a collision is imminent, this system will automatically apply the car’s brakes and steer around the person, while keeping to its traffic lane. The driver will be alerted to the system’s operation by a warning on the colour head-up display. In terms of passive safety, the LS’ robust structure provides a high degree of passive safety to protect occupants in a collision, and the car is equipped with up to 14 airbags. More than ever before, luxury sedan drivers demand greater handling agility and performance feel, without sacrificing comfort. It’s one of the hardest balances to achieve in a vehicle, yet Lexus’s new GA-L platform meets the challenge. The platform made its debut in the LC coupe and now, with a longer wheelbase, underpins the new LS. The GA-L platform is the stiffest Lexus has yet created, providing a perfect foundation for improving handling, ride smoothness and cabin quietness. The design of the GA-L platform allows the car’s centre of gravity to be made lower, with most of the mass, including the engine and passengers, moved to a more central and lower position in the chassis. This has a direct, positive impact on ride, handling stability and comfort and contributes to a more rewarding and engaging experience at the wheel for the driver. Collision safety was also the key for development of the GA-L platform. Cabin deformation and the amount of impact energy transferred to the occupants have been minimised. Body structure was enhanced with the use of new bonding technology, lighter materials such as high-tensile strength materials and aluminum bumper reinforcement. The LS has a history of outstanding suspension compliance, yet Lexus saw opportunities for new gains to be made in this area as well. The front suspension system has double ball joints on the upper and lower arms to permit control of the smallest movements from driver inputs and road conditions. Beyond sharing the workload, this arrangement helps optimise suspension geometry to increase wheel control and gain more precise steering response with better initial effort. At the rear these ball joints are replaced by bushes to ensure superior ride comfort. To reduce unspring weight, and thereby promote agility and comfort, aluminium is used extensively in the suspension’s construction. 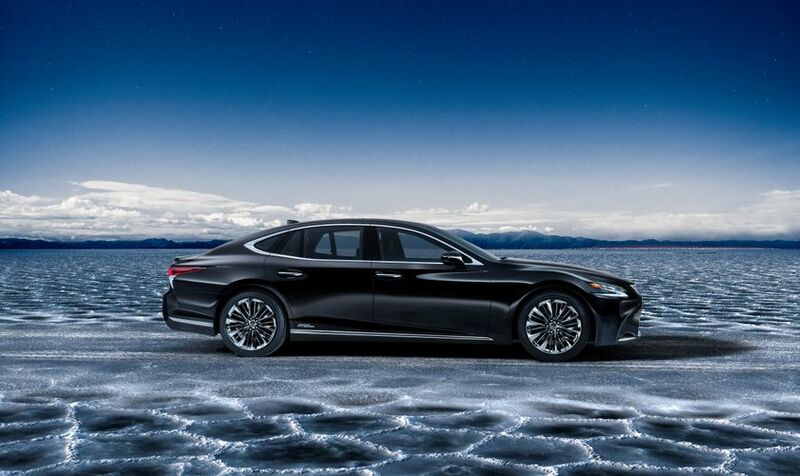 Following the “Yet” philosophy, that has guided the design thinking for successive generations of the LS, Lexus has created a design that offers the room and comfort of a prestige three-box sedan, yet with the stylish silhouette of a four-door coupe – a look that holds a stronger appeal for younger luxury customers. 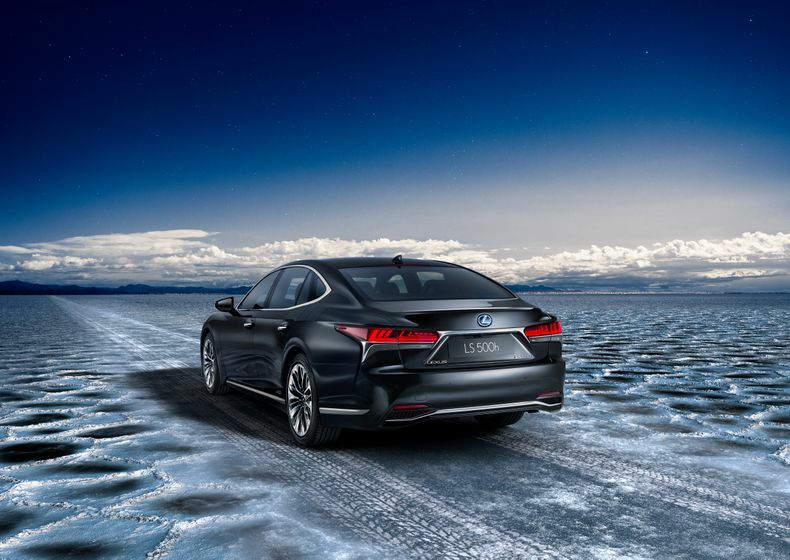 Lexus designers took full advantage of the opportunity provided by the low centre of gravity and optimum weight distribution from the LS’s new GA-L platform to produce a lower profile and a long wheelbase, giving the car a stretched, ground-hugging appearance. Compared to the current LS, the new model sits about 15mm lower, while the hood and boot are 30 and 40 mm lower respectively. 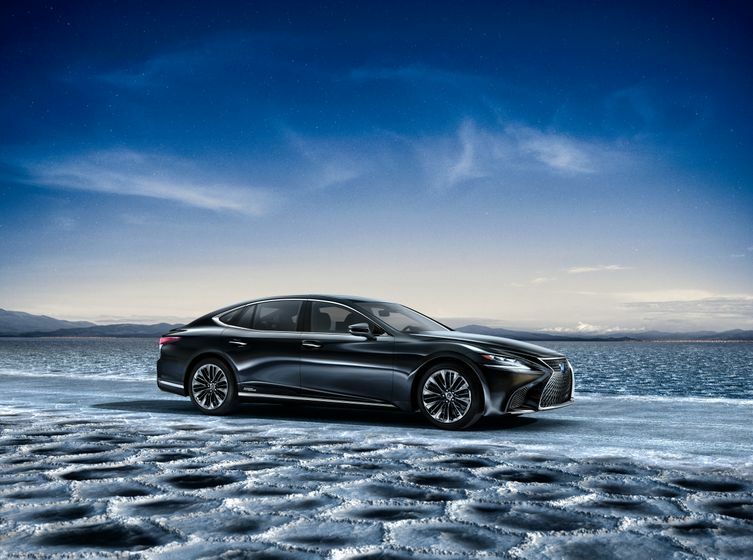 The new LS is only offered in long wheelbase form: at 3,125mm, the wheelbase is in fact 35mm longer than on the current long wheelbase LS 600h L.
The LS is the first Lexus sedan to feature a six-side window design, marking a break with tradition. This approach has helped achieve a sleek silhouette and a low-lying fluidity in the design. The LS is also the first Lexus to be fitted with flush-surface windows that integrate smoothly with the side pillars. 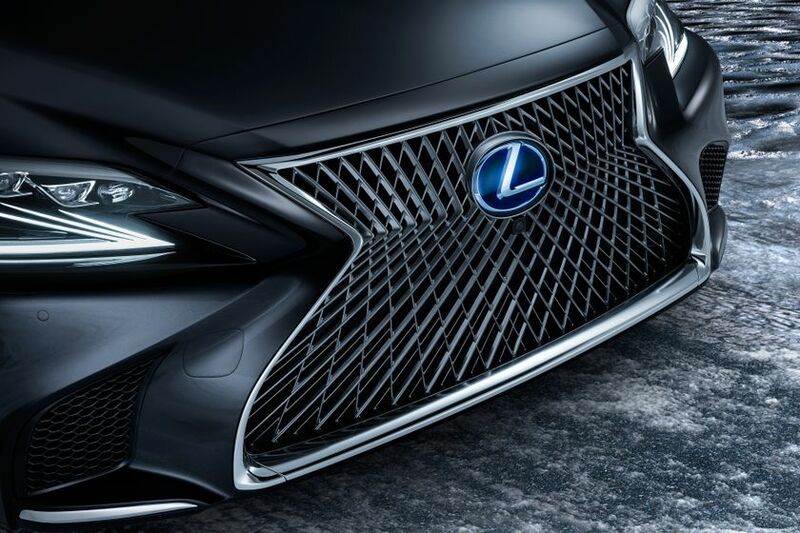 The LS displays a unique rendition of Lexus’s signature spindle grille, designed to convey an aura of dignity that befits the model’s position at the pinnacle of the Lexus brand. The grille has a mesh texture that appears to change in different light, created through months of intense CAD development and the hand-adjustment of thousands of individual surfaces to gain the optimum effect. For the new LS, creating a new standard of flagship luxury was not simply a matter of adding more features. Inspired by Omotenashi, Lexus sought to deliver a cabin that welcomes and envelops the occupants and treats the driver like a partner. The watchwords for the design team were “progressive comfort”. New seat designs, including 28-way power front seats with heating, cooling and massage functions, exemplify this approach. The organically shaped dashboard design clusters information displays at a uniform height to support the “seat-in-control” layout – the driver can operate all systems without having to change their posture. In addition to a 12.3-inch navigation display, the LS can be fitted with an optional 24-inch colour head-up display – the largest in the world - that projects a variety of key vehicle information and performance data into the driver’s forward line of vision. 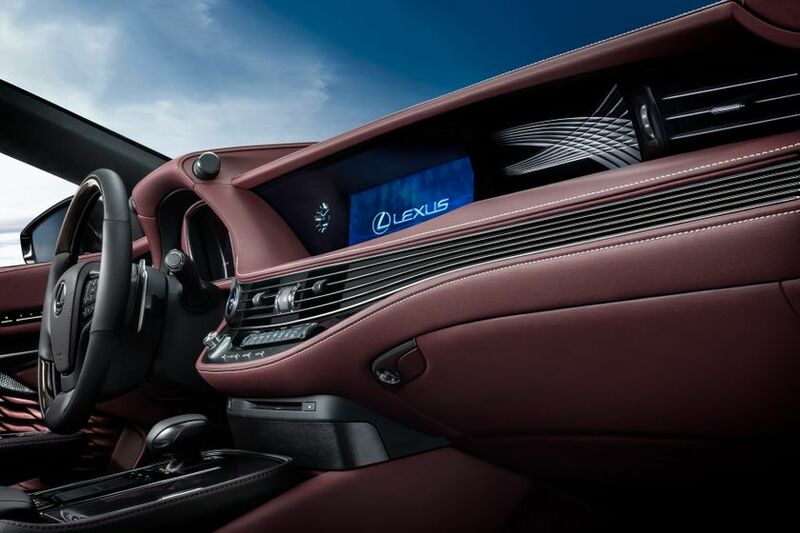 The infotainment system has a more inviting graphic user interface and is controlled using the next generation of Lexus’ Remote Touch control system. The intuitive operation is designed to mirror the way a smartphone is used; it can also recognise “handwritten” commands – outline letters traced using a finger on the touchpad. Because the new LS is lower than previous models, Lexus has equipped the optional air suspension with an access function. Activated when unlocking the car with the smart key, access mode automatically raises the vehicle and opens the seat bolsters to welcome the driver behind the wheel. To preserve headroom within the car’s lower roofline, the LS is fitted with is an outer, slide-type sunroof. 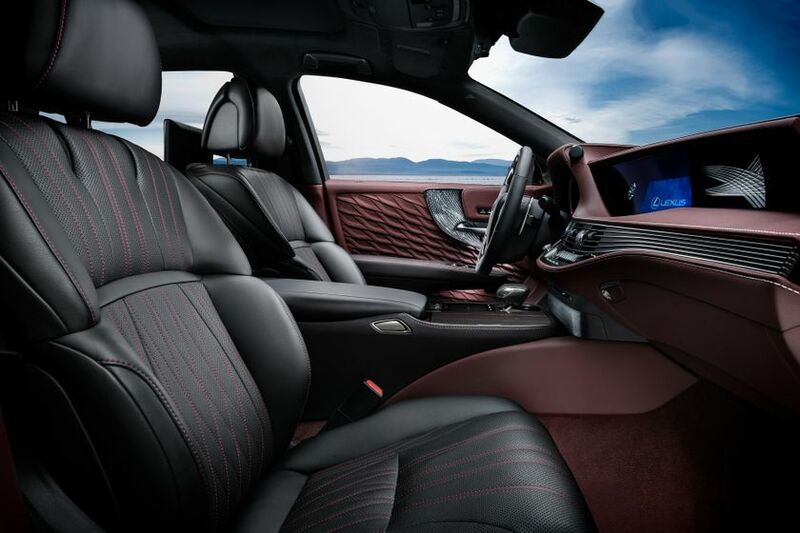 Lexus also lavished attention on the rear seats, producing a design that provides seamless continuity between the trim and seatbacks. There are heating, cooling and massage options for rear seat occupants, while power-controlled rear seats are available with a Shiatsu massage function and a raised ottoman leg rest. These form part of an extensive rear seat luxury package that offers more legroom than in any previous LS. With this optional package, the seat behind the front passenger can be reclined up to 48 degrees, and raised up to 24 degrees to make it easier to exit the vehicle. 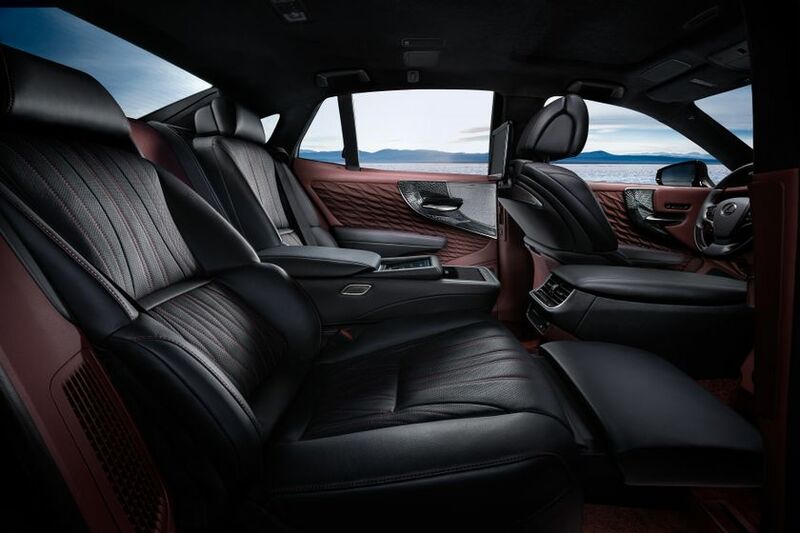 Lexus has designed the LS cabin for utterly quiet cruising, with new sound suppression methods used to further hush the environment compared to previous LS models. Active Noise Control quiets the cabin by detecting the sound of the engine coming into the vehicle and cancelling certain frequencies, using antiphase sound from the audio speakers. The serenity of the cabin provides an ideal stage for the Pioneer premium audio system. Featuring a sophisticated ‘Quantum Logic Immersion’ sound tuning technology and ceiling array, the Mark Levinson system creates a 3D surround audio for a concert-like experience. The quality, precision and pride in perfection that define Lexus’ Takumi craftsmanship are richly evident in the luxury detailing in the new LS, as befits a flagship sedan. 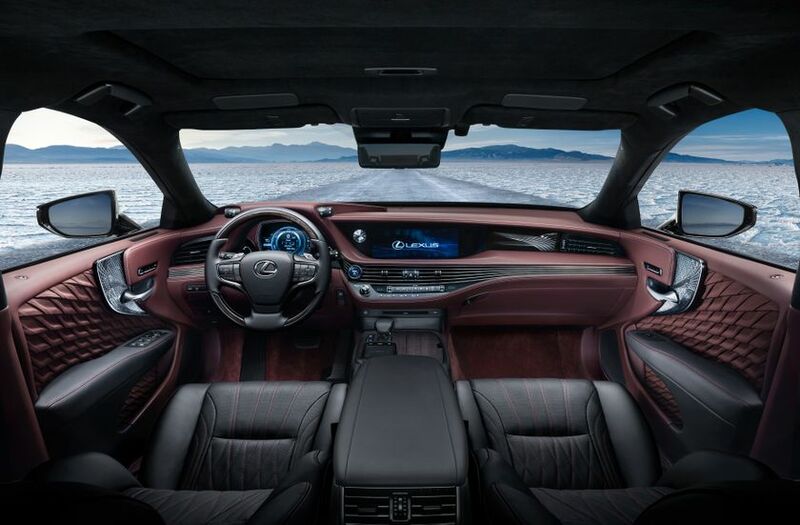 Lexus has produced a unique aesthetic for the new LS which can be witnessed in elements such as the interior lighting and an exceptional attention to detail in the finish and appearance of everything you see and feel. Japanese culture provided the inspiration for a new approach to creating trim elements, combining traditional influences with advanced manufacturing techniques. This can be seen in signature touches, such as ambient lighting inspired by Japanese lanterns and armrests that appear to float next to the door panels. Natural woodwork and the application of sophisticated sliced wood and laser cutting technologies have been used to produce new interior finish options, including Art Wood/Organic, Art Wood/Herringbone and Laser Cut Special. The grain pattern of Art Wood is achieved by combining different colour woods and is an original Lexus design, created using Takumi craftsmanship skills. The LS’ new cross grain finish is larger with sharper contrasts between light and dark, creating a more vibrant effect. The new Laser Cut Special emphasises the contrast between precise metal lines and natural wood. The hand-pleated door trims were inspired by Origami, the Japanese art of creating three-dimensional forms from a single piece of paper. The door panels were originally rendered in paper by a skilled fabric artisan. 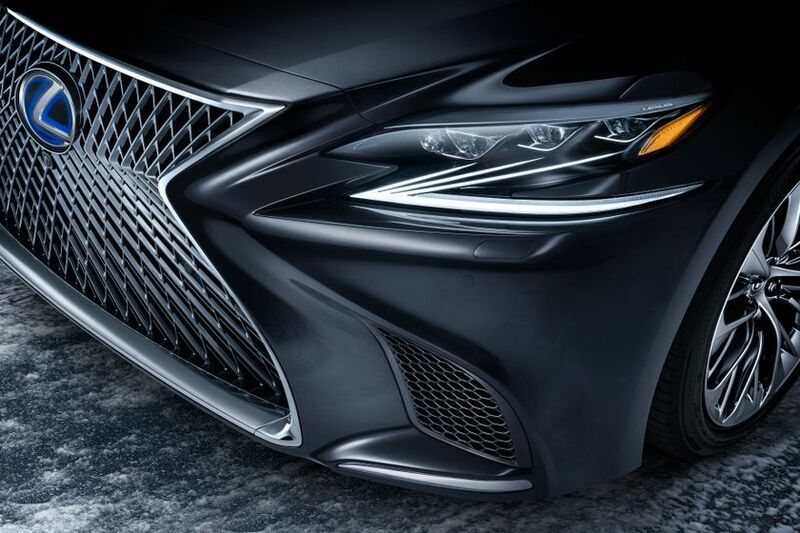 The finished three-dimensional pattern captures the Lexus “L” motif in its intricate and precise folds, conveying a different effect when seen in daylight or the cabin’s night-time illumination. 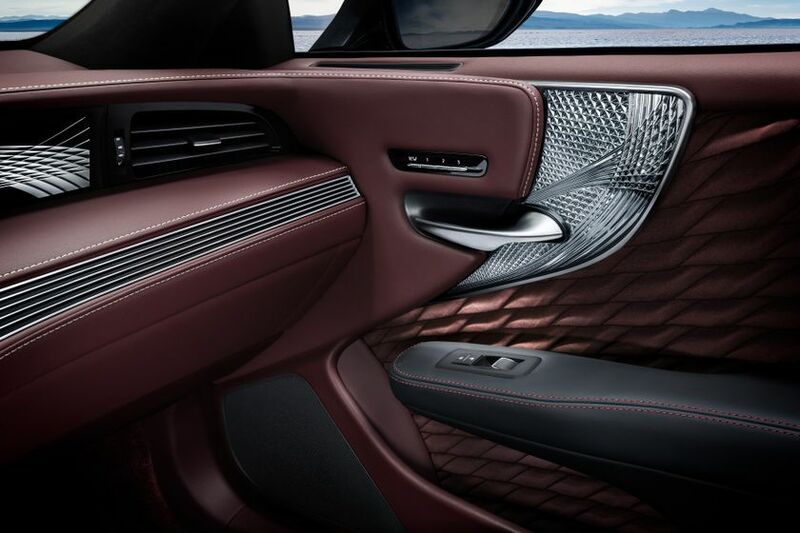 For the ornamentation panel, the aim was to express Lexus’ Time in Design philosophy. To achieve this, the team called on the skills of Kiriko artisan glassworkers who produced hand-carved designs that capture the contrast created by light and shadow. Through painstaking trial and error, a design was chosen that looks beautiful and sensual from any angle. Although fragile in appearance, the glass has been treated using reinforcement technology to ensure it is robust for use in a vehicle interior. The hand-carved design was reproduced using advanced glass production technology, which precisely scans and digitises tens of thousands of facets. In the next step the glass ornamentation undergoes a series of treatments such as polishing and strengthening conducted by specialised Japanese Takumi craftsmen.